We picked this hotel after an excellent experience at the Tenerife Holiday Village last year. I hope to give an honest review and some comparisons that may help in a decision between the two Canaries Holiday Villages. After reading many reviews and given that we were travelling with a toddler we upgraded to a superior room, we also liked the sound of the bungalows on the seafront so we emailed the manager a couple of weeks before flying requesting one. WOW what a great decision! On arrival we were swiftly checked in and were informed we would be staying in C20 rite on the sea front. After a short walk down the hill we found our accommodation and it was around the same size as a one bedroom flat. Double Bedroom with cot, lounge/kitchen with fridge freezer, microwave, two ring hob, kettle, coffee machine, iron and board, flat screen TV and DVD with a few English channels inc BBC & Sky Sports 1. 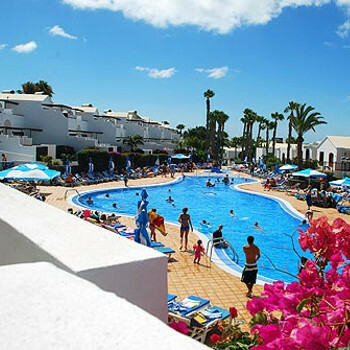 Terrace has two good quality sunbeds with soft mattresses patio table and chairs and a clothes airier and a lockable gate, and above all a fantastic view across the sea to Fuerteventura. Having a little one we spent a few evenings sat out here with a drink whilst our lad had an early night. Rooms C18 to C30 will ensure a sea view but C22/24/26&28 have about 4 steps to negotiate, that could be a pain if you have a sleeping tot in a buggy. The standard rooms mainly seemed to have good views as the hotel is set on a steep hill but many have lots of steps up to the gate. Not a problem with older kids but again a pain if you had a buggy. The hotel and facilities are clean and tidy but the main pool area was very cramped. This is where the daytime activities go on and the sunbeds were squeezed together, also the daytime stage and main buffet area were all too close together. We spent most of our time at the toddler "Mickey Mouse" pool. Our only real serious concern with all the pool areas was the lack of shade, this really does need to be addressed if it is to operate as a child friendly venue? There are a few rows of permanent straw covered umbrellas but very few proper adjustable/movable parasols. Food and drinks wise the complex is very good. Two buffet restaurants, the ground floor one being a bit school dinners but the one upstairs was nicer. Also at lunch you can get waiter service in the Italian and have fresh pizza/pasta/ jacket potatoes. Included are a visit to the Italian ,Steak house and Tex Mex restaurants and these were very good in our opinion. The staff on the whole were very good, many of the waiters and bar staff seemed to be north African and whilst not a problem this did take away from the whole Cannarian experience we have enjoyed in the past. The resort of Playa Blanca was great, with plenty of bars and places to eat all within a ten minute walk of the hotel. The beach was great and very safe for the little ones. If you turn right at the beach you have a great promenade that reaches 2.5 miles to the lighthouse in the distance with a few watering holes on the way, great for a walk with the pram and lots of rock pools waiting to be explored. If like us this year you want to mix it up a bit and eat out a few times during your stay then Lanzarote is the place for you. Would we come back here ? Yes indeed we would if we could get the same room but the world is a big place and after 20 years of holidays we have never returned to the same place twice. We visited Flamingo Beach last month on a late deal. We feared that the weather would let us down when we saw the life guard at the pool wearing his scarf the first afternoon. Luckily the weather improved but the Flamingo Beach is not the place to be in cooler weather. Unlike other places we have been there are no facilities to sit inside. The downstairs buffet area is not somewhere you could sit all day to keep warm. On a better note the food was excellent. I recommend the upstairs restaurant for breakfast and evening meals as there are no queues and under 6's aren't allowed. The apartments cater very well for kids but there is nothing for teens to do and the night-time entertainment was very poor. We sat in the pool bar most nights but my husband thought it was like sitting in a large soulless garage. The apartment was basic, fine but the marble was very cold, but would be OK in hot weather. The location was excellent and the walk both directions along the prom were absolutely lovely. A lovely week saved by the nice weather but we wouldn't choose Flamingo Beach again as have decided to stick to hotels as they are more comfortable if the weather is not so great. We'd never gone All Inclusive before and we won't do it again. Every meal time felt like a rowdy school hall. It's a buffet queue system and not all holiday makers have the same idea of cleanliness or manners. The maids were excellent and went above expectations when it came to cleaning our apartment, though we did over the fortnight see cockroaches twice in our apartment. Getting a sun bed by the pool was a farce as they all get snapped up at around 7:30 in the morning with towels to reserve them as soon as the staff unchain them. Too often we saw sun beds going unused for as long as 5 hours with a single towel draped over it while other holiday makers had to make do with the tiled concrete ground and towel to lie on. The food was okay but nothing special, however there was plenty of choice most days, the only problem was the lack of hygiene of many of our fellow holiday makers. It seemed difficult to find real natural orange juice, and the juice in general was strange, like a mix of squash and juice together. The staff were very good with the kids and very friendly, the grumpy lady on main reception was more than compensated for by the rest of the staff. The location was fantastic, it was a three minute walk to a wonderful beach, we used the beach a lot more than the pools because we often couldn't get a sunbed. One pool was closed for a day while they cleaned the poo out of it. The in-house entertainment was diabolical and offensive to the intellect of most people, but the guest entertainers were often very good. The kids 'Widget' show died a death with its target audience - kids. They lost interest and started running around and doing other stuff. Would we go back, no. By the end of the second day I'd seen enough 'England' tattoos and grown men dressed as footballers to last a life time. Unfriendly and unhelpful staff, poor layout of hotel, very tight on space, no sun beds or shade, reps advise to get up at 7am and sit on sunbeds for 2 hours. Plus points were that the maid kept our bungalow very clean and was very friendly, the rep that we spoke to was very helpful. However the holiday was a disaster, we were informed that the complex was new and refurbished from May 1st 2010 so expecting great new shiny complex, but our bungalow was shabby and dowdy, as was some of the complex. We were unable to get near to the hotel pools as sunbeds always taken very early in the day with peoples towels. The brochure advertises an indoor pool, however we were told we couldn’t use it as was for adults only! Had a letter few weeks before leaving to tell us the beach was closed, and that we could get a shuttle bus to nearest beach, however booked holiday so could walk to beach and use pool. Could not do either. Food was ok but very bland and boring, lots of queuing in restaurants at all times. Entire complex felt very busy all the time, there was nowhere to relax and unwind. Not happy would not recommend or visit a holiday village again. Our complaint is in the hands of first choice.